Head describes the Big Joy as being able to float so easily in powder, you won''''t be able to take that smile of joy off your face. At 110mm with tip rocker, this ski can get up on top of crud, fluff, junk, and pretty much anything you encounter out there. Handy skin attachments make this ski an easy choice for backcountry enthusiasts that want a ski to perform just as well on the way up as it does on the way down. Big joy is exactly what this ultra-light all-mountain ski delivers for strong skiers, especially when floating through fresh pow. The Big Joy also features Head's female-specific LIBRA architecture making it lighter, more balanced and easy to control. Wide, with a big sidecut and packed full of performance tech this ski is definitely a Big Joy. Product Details: GRAPHENE Women's Camber ERA 3.0 Super Light Weight Distribution Structured UHM C base Allride Rocker Superlite Sandwich cap construction. The item "Head Big Joy (168cm) woman's big all mountain freeride powder skis -45% £310" is in sale since Friday, October 19, 2018. This item is in the category "Sporting Goods\Skiing & Snowboarding\Downhill Skiing\Skis". 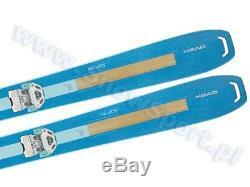 The seller is "skiboard_proshop" and is located in Glasgow. This item can be shipped worldwide.